Who doesn't love potato chips to snack and i'm no exception and when i saw oven roasted potato chips at tastejunction.blogspot.com i knew what i wanted to try for this week's BlogHop from Anamika's blog. Clean the potatoes and slice them (with the skin) to about 1/8 inch thickness . And leave it on cold water for half an hour. Remove from water and let it dry. Then toss it with oil, salt & pepper. Now line potato on the baking tray in a single layer and bake for 5 mins. Flip them over and then let the other side too get golden, another 3-4 mins. If u r interested plz link it to my Bake Fest event..
Wow thats a super guilt-free chips,quite addictive..
Nice to know that chips can be prepared like that. Great recipe. 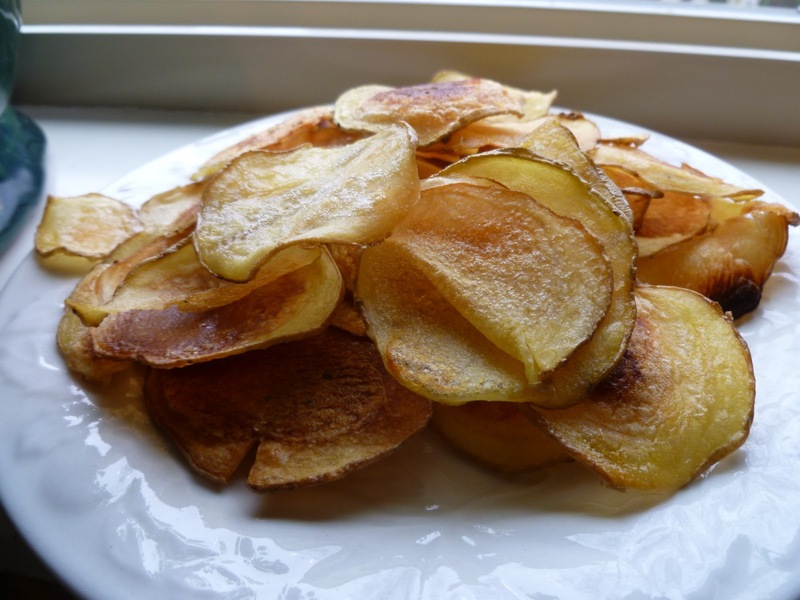 very healthy and delicious potato chips..thanks for sharing.. I wouldn't mind having those guiltfree delicious chips. Yum!